Canadian brand Norco reckons it’s on to a winner with the 2019 Norco Fluid FS 1 and we might have to agree. 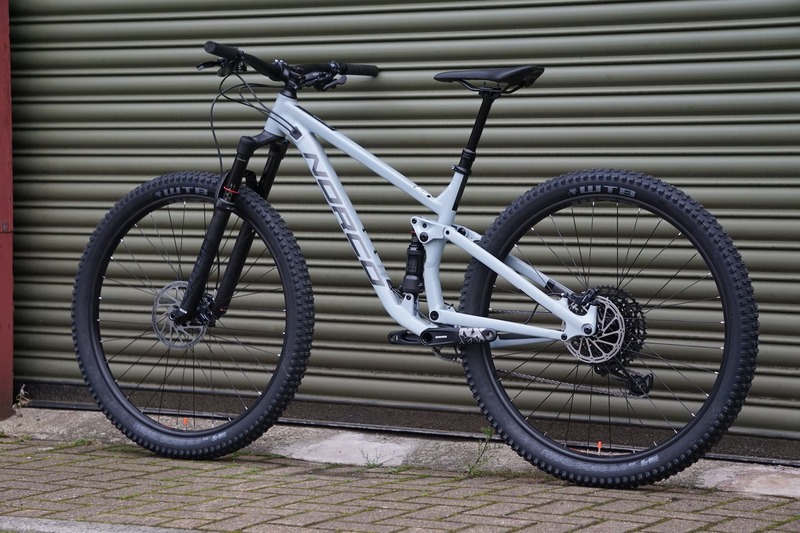 For 2019 Norco continues to work closely with Evans Cycles to offer UK only bike builds that rival buy direct models for value for money. The 2019 full-suspension range of bikes kicks off at just £1195 and tops out at £1850 for this flagship Norco Fluid FS 1. This SRAM NX Eagle equipped bike costs just £1850!? 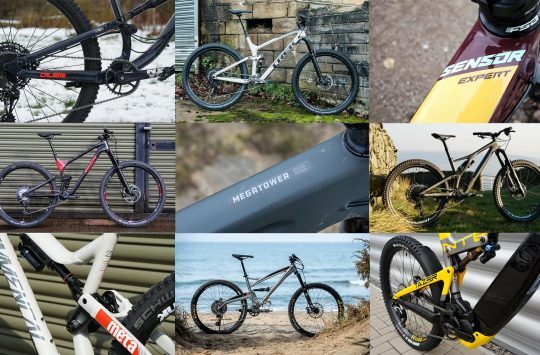 In a year where we’ve seen top-end bike prices increase and with some brands now charging £10,000+ thanks to Fox Live Valve and Shimano’s 12-speed XTR, it makes a refreshing change to see a brand focusing on building sub £2000 mountain bikes that aren’t only great value but promise to perform well too. 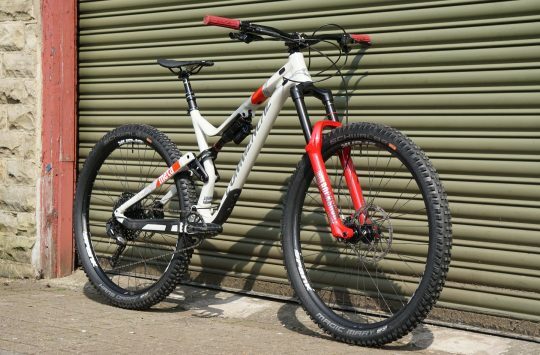 The Norco Fluid FS 1 promises both in boat loads! 120mm of rear wheel travel. Designwise the Norco Fluid FS 1 get’s a similar suspension layout as the Sight A9.2 we tested earlier in the year, but this isn’t the same frame. 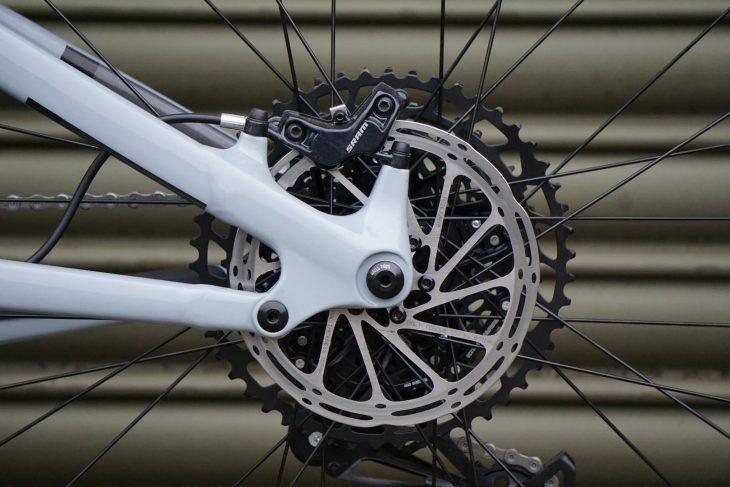 The 2019 Fluid has 10mm less rear wheel travel than the Sight we tested, 120mm in total, and gets a much cleaner finish, and more compact main link. Norco has also gone for size specific wheel sizing on the Fluid so sizes S and M come with smaller 27.5in wheels while sizes M to XL get 29in wheels. Compact linkage makes way for a bottle cage. Our test bike is a size medium with 29in wheels. Reach on this bike is 440mm, about average by today’s standard. The seat tube is just 420mm meaning there is lots of room to size up if you wanted to go longer. Small and Medium-sized bikes get a 66° head angle, L to XL a 66.5°. All bikes have an effective seat tube angle of 76°. Smooth welds and internal routing, surely Norco has its pricing mixed up? 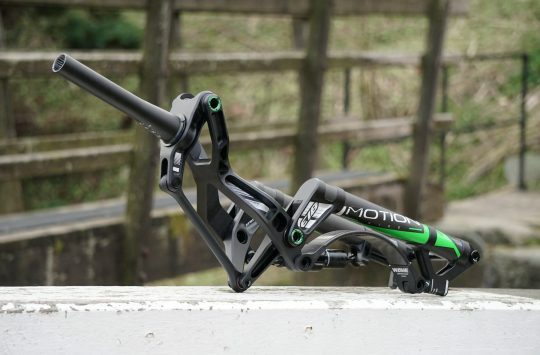 Out of the box, the Fluid FS 1’s frame and attention to detail really took us by surprise. All the welds have been smoothed off, and with the neat internal cable routing it looks almost like a carbon frame from a distance (if you squint). 2 piece main rocker link. The main linkage is a 2 piece design and is very compact, and is much more visually pleasing than the bolted together linkage of the Sight. All in, it’s a great looking frame, one that we would expect to demand a price of £1850 by itself let alone as a complete bike. This does not look like a sub £2000 bike. 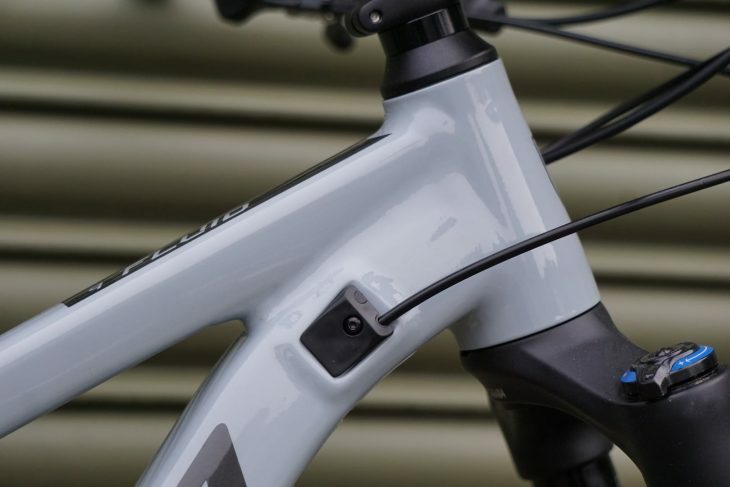 Despite the great looking frame, and lovely grey finish, Norco doesn’t seem to have had to cut back on the build kit to keep pricing below £2000. RockShox Revelation and SRAM Guide T brakes. Suspension is supplied by RockShox. 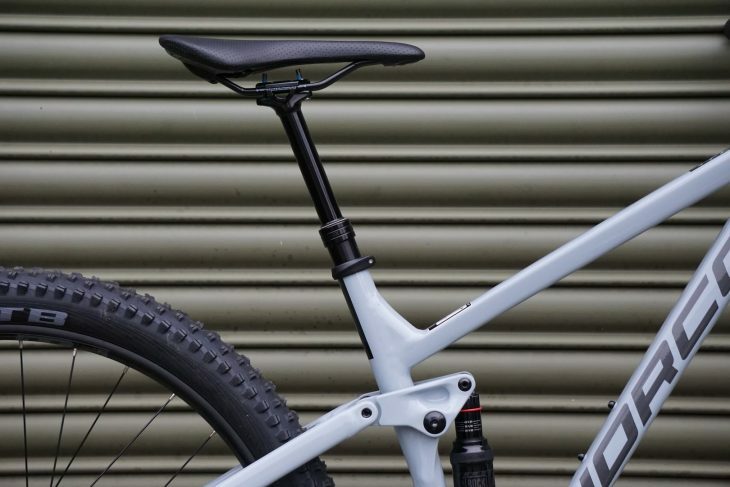 A Revelation RC up front with 130mm of travel might not have the same ring to it as a Pike, but remember both the Revelation and Pike share the same chassis now meaning many of the damping upgrades are interchangeable between the two. 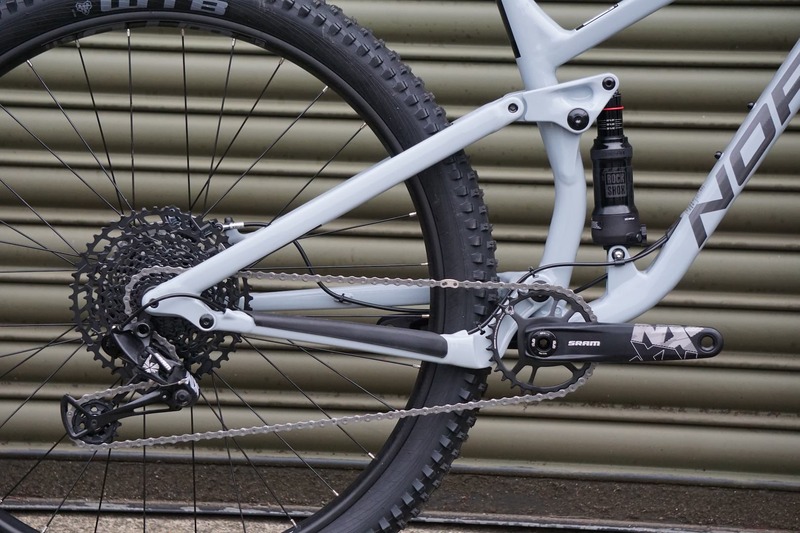 The rear shock is a short stroke RockShox Deluxe Debonair, with rebound control but no lockout, so let’s hope the kinematics of the frame make for a good climber. 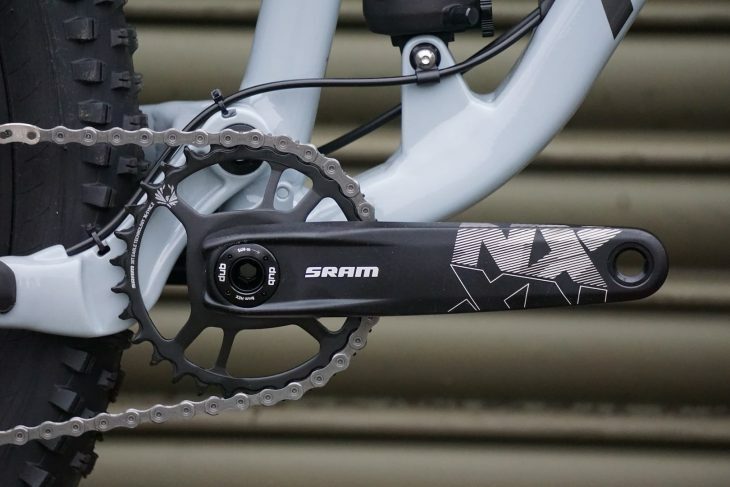 SRAM NX Eagle 12 speed. 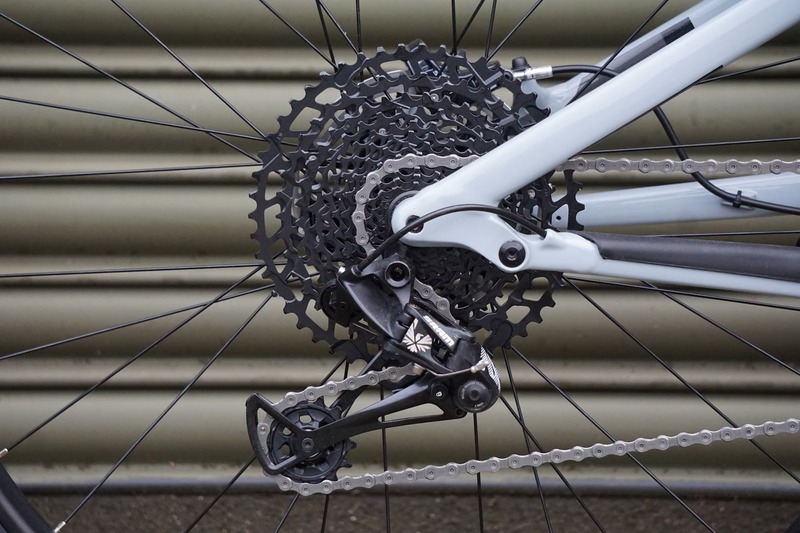 The quality suspension package is backed up by the surprise inclusion of the 2019 SRAM NX Eagle 12 speed groupset. If we were expecting any type of cost-cutting on the Norco FS 1 it would be on the drivetrain, but here we have a 1×12 drivetrain and massive range for climbing even steep terrain. We’ve tested NX Eagle already, read the review here, and it’s good stuff. 4 pot callipers are a neat addition. SRAM also provides stopping power via a set of SRAM Guide T 4 pot brakes. 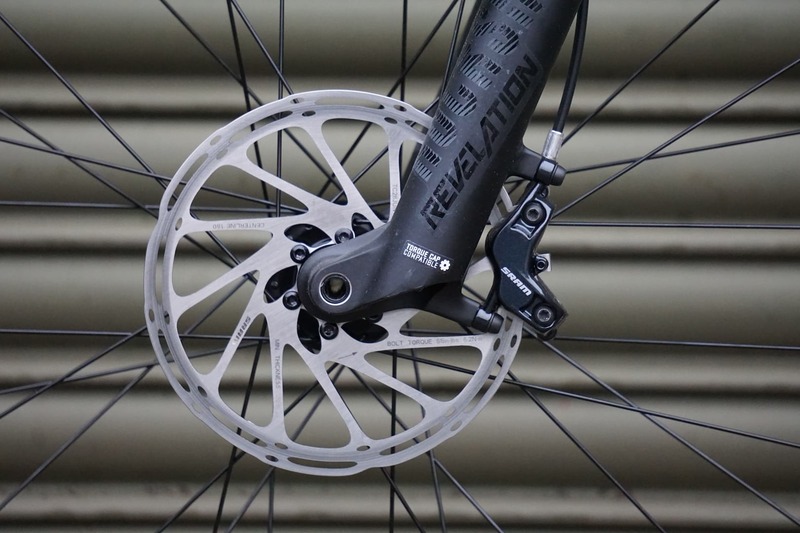 Again, these are a great set of brakes and offer decent power and modulation. Tranz X dropper post is cable activated. Handlebars, grips and saddle are Norco own brand, while the 50mm stem comes from Tranz X. There’s also a cable operated, stealth routed Tranz X dropper post as standard too. WTB rims and tyres on Novatec hubs. 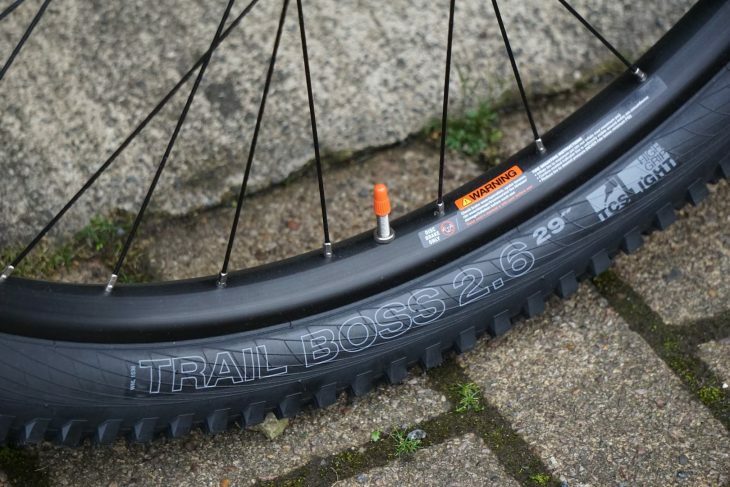 Wheels are made from Novatec hubs laced to 29in WTB STP i29 rims shod with WTB’s own 29×2.6 Trail Boss tyres. We’re all fighting to ride it but Hannah has won! The whole bike looks incredible value for money, and it has already been nabbed by Hannah who plans to test the Norco Fluid FS 1 at Bike Park Wales this weekend. 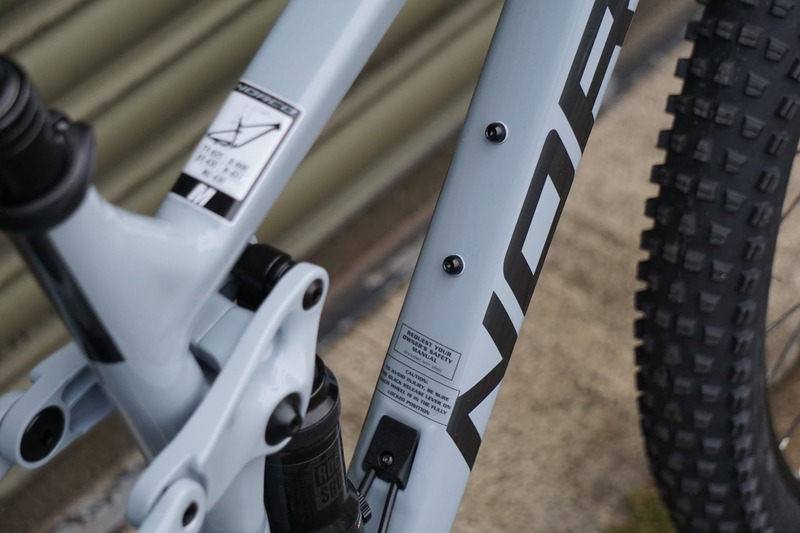 Keep your eyes peeled for more first looks this week and for the 2019 Norco Fluid FS 1 review later this year. 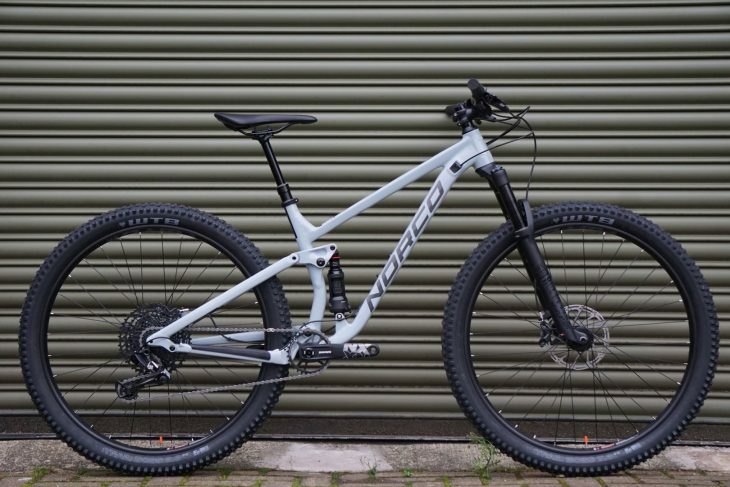 Tell us what you think of the 2019 Norco Fluid FS 1 in the comments section below. Flying the flag for British design - a visit to Ison Distribution - Part 1 - Gusset Components. That is a lovely looking bike. No nonsense & proven spec, good angles, right amount of travel, big wheels and great price. Tempted! Norco look great this year! 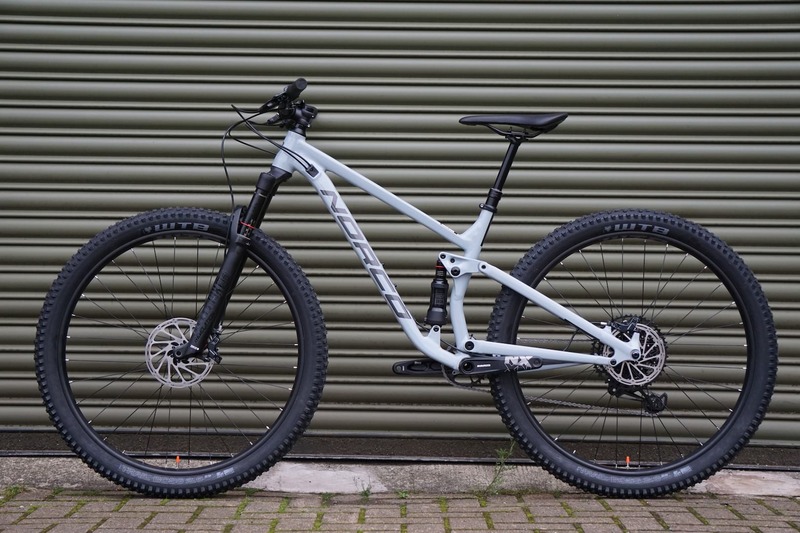 For broadly similar money you can also get the 160mm Range A2 for £2150 or 140mm Sight A2 for £2400 with the similar drivetrain, decent brakes and RS Yari/Fox Performance level suspension. That’d be exactly the kind of bike I’d buy if I was needing a replacement. And I like the undercoat grey colour. There’s an error in the framesize/wheelsize info somewhere. Text says S & M are 27.5, but you got an M 29er. @tthew thanks for that. Looking at the info we have (and on the Evan’s site who are the Norco distributors) it looks like Medium is available in both wheel sizes but I’m going to double check this along with XS availability. That is right to the top of my I want list. The one I might actually manage to buy. £150 off if you trade in an old snotter too, so £1700! 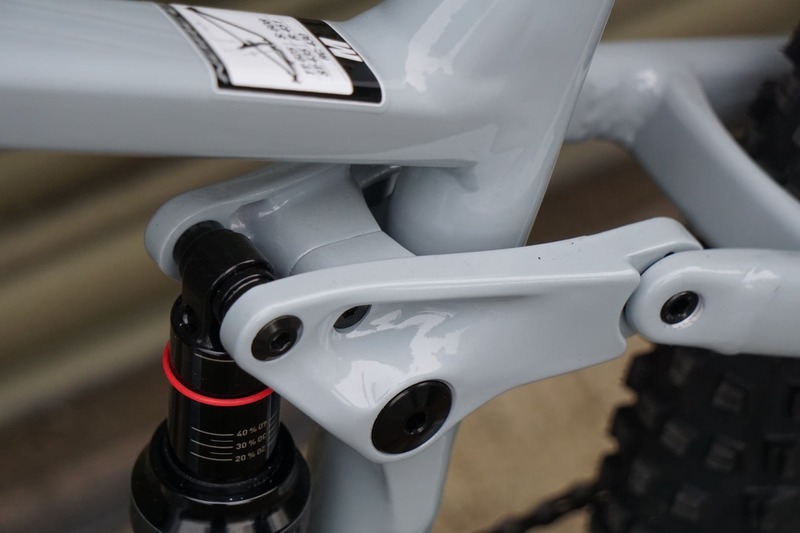 The only difference you may see on the shop floor is a 35mm stem on the black (women’s) rather than the 50mm on the grey as this is the only thing unclear on the spec- listed as 50mm/35mm stem but all the geo charts state 50mm stem. If this is the case there should be no problem for the shop to change the stem length if you need to. Essentially there is nothing different about the ‘women’s’ bikes, just buy the size you want regardless of gender. Sort it out please Norco! ok, In addition to my ramblings above, further research reveals that the women’s versions are fitted with different saddles and grips, nothing major there though, as you’d probably change those to a personal preference anyway. The stems are all 50mm but the bar bore is 35mm. Maybe that should have been more clear. The suspension setup guides are designed for all heights and weights of riders. There is no specific shock tune for women. Bikes fit people. Yep I’m super keen to hear how it rides. I’m itching to pull the trigger on this!! My only slight reservation at the moment is the shock orientation. Is there a benefit to mounting it this way round? And it could it lead to potential limitations if want to change the shock?